If you want to identify a serious potential leader, someone committed to getting America back on track as a free and prosperous nation under God, just check the intensity of efforts of those on the left to try and destroy the reputation and career of that individual. The more time and energy liberals invest to destroy someone, you can bet that this is someone who loves America, what it stands for, and who can make a difference. Latest case is attacks on Rep. Steve Scalise (R-La.) because he spoke, in 2002, to the European American Unity and Rights Organization, a white supremacist group founded by racist David Duke. Scalise says the remarks were in the context of promoting tax reform legislation he was sponsoring when he was in the Louisiana state legislature, that he addressed many groups in promoting this legislation, and that he didn’t appreciate then who these folks were. But, really, who cares who they were? Shouldn’t a legislator with reforms to improve his state or his nation be free to sell good ideas to anyone? How far do we let liberals go in censuring speech and ideas in America? Even Dr. Ben Carson, whose magnificent career led to becoming head of pediatric neurosurgery at Johns Hopkins Hospital, had to pull out of giving the commencement address at the very university where he built his career because liberals didn’t like his views about marriage. 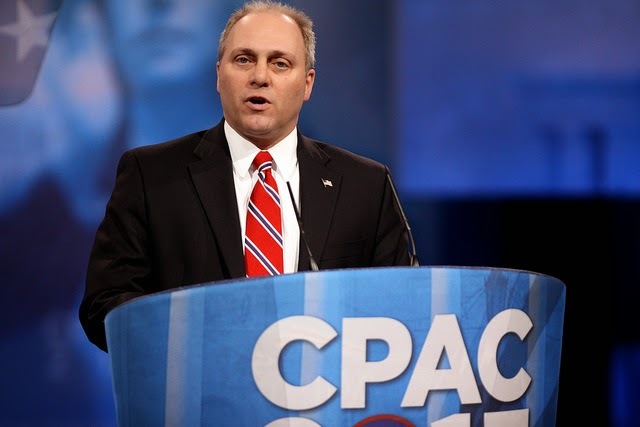 Is Steve Scalise a racist? Absurd. I know him since he started serving in the House of Representatives in 2008. He is an outstanding Christian American patriot without a racist bone in his body. I cut my teeth watching the bring-down-America forces when I showed up on Capitol Hill with a group of black pastors in 1991 to support now- Supreme Court Associate Justice Clarence Thomas during the ruthless character assassination he endured in his confirmation hearings. I watched the same forces succeed in destroying the career of another American patriot, former Virginia Governor George Allen, because of his innocent misuse of an obscure racial epithet. And as they tried to do the same to my friend, former Missouri Senator and US Attorney General John Ashcroft. We can learn something about who these liberals are by noting who does pass their leadership test. How about our own current president? President Obama, in 2013, became the first sitting US president in history to address the annual meeting of the nation’s largest abortion provider, Planned Parenthood. Planned Parenthood reports providing 327,653 abortions during its last fiscal year. With 78 percent of Planned Parenthood clinics located in minority communities, the life in the womb they uniquely target for death is black life. Or how about America’s 42nd president, Democrat Bill Clinton, who never lost the support of his party despite sexually abusing a confused young intern in the Oval Office of the president and becoming instrumental in making the vocabulary of degrading sexual behavior part of the lexicon of America’s youth. And then there is the longest-ever serving member of congress, West Virginia Democrat Senator Robert Byrd, who passed away in 2010. Byrd served as Senate Democrat minority and majority leader after it was well known that for years he was a member of the Ku Klux Klan and as a young man started a Klan chapter in West Virginia. Byrd, with a long history of overt racism, as President pro tempore of the U.S. Senate, was third in succession to the US presidency. The forces of darkness will not relent. Conservatives must stand firm and support leaders like Steve Scalise, who believe in America, in freedom, in our constitution, and in the traditional values that hold our families together.